In-house IT staff members generally work at a slow, but deliberate pace. This ability to spend as much time as necessary addressing a single problem can lead to a thorough implementation of a solution. This pace also allows time for research and creates an opportunity to document important processes along the way, with the right people/person on staff. In-house IT support has the benefit of being able to immediately respond to technological issues that may arise. Having a “pull-by-the-shirt” IT person can better satisfy those finicky people that have little patience. Startup organizations with smaller IT departments (1-2 people) often have a constant flow of high priority items that need to be addressed. This stream of time-sensitive tasks can overwhelm a limited team and cause important business development processes (like research and documentation) to fall to the wayside. If a company can only afford one in-house IT staff member, that one person often holds “the keys to the kingdom.” This means that all of your company’s important data lives in one person’s head and can put your company at risk if they leave or become malicious toward your organization, or if they decide to leave unexpectedly. Hiring in-house can be expensive. Often, a single employee will not be enough to properly manage the complexities of your entire IT system. If you require a broad range of expertise, you could end up needing to hire 4 or 5 people to fill the gaps. The costs associated with that many full time employees can stifle early stage business growth. With outsourced IT staffing from managed service providers (MSPs), yourcompany receives the benefit of 4/7 support 365 days a year. You won’t xperience downtime during vacation days or nights and weekends. Many IT providers (like Data Evolution) have a full time emergency contact line that can provide adequate support and response time during those off-hour emergencies. 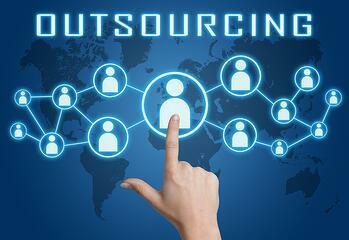 Outsourced IT providers have a vested interest in serving you beyond your expectations. Unlike a full time employee who can establish a “less than ideal” pace and get away with less-than-satisfactory work, an MSP has to continue to earn your business day after day, year after year. Working with an MSP can be a fraction of the cost compared to hiring full time staff. An outsourced IT team gives your business access to a wide range of skilled experts who can service most any problem or need you encounter. An established MSP will also have the tools needed, like electronic ticketing, documentation and monitoring systems that are needed to provide an efficient IT solution and positive experience for your employees. Experienced MSPs have been in the game for a while. When a problem arises, an experienced company like ours has the know-how to stop, think it through, and offer a sound strategic solution. Many companies fall into the trap of hiring the “young gun” IT person who comes at a low cost, but doesn’t have much experience. You don’t want your IT staff simply shooting from the hip. While good MSPs spend time at your location each week, the majority of your service issues will be handled remotely with a dedicated representative. While this is not a problem for every company, it’s important to note as some people don’t enjoy working with remote support. With an MSP, you only have an IT representative on site a percentage of the time. In the event you experience an emergency that needs immediate attention, you’ll experience a delay while waiting for your representative to show up. It can be hard for a new or smaller organization to know what the right approach is for their company. It takes an understanding of where you are today and some level of vision where you are going and the types of systems to get you there. 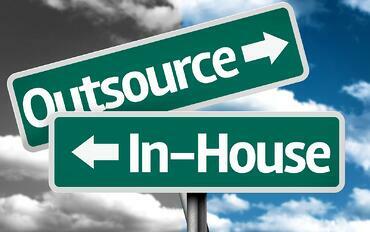 Most often an outsourced solution is the best way to start. The right partner will work with you to understand when a balance between utilizing in-house and outsourced IT staff will be appropriate. Every business is different and will generate different types of data and need different types of systems required to move the company forward. Having a full-time stakeholder (a director level position with strategic vision as well as understanding the geek talk) who can manage an outsourced team is an ideal approach for companies moving to larger more complex systems or nearing commercialization. This stakeholder can focus on your long vision of lab and data acquisition processes, sales teams and oversee a team like ours that manages the day-to-day needs. As an early stage company, you have the unique ability to be flexible in your approach to solving IT problems. Starting with an MSP should be a smart choice while combining these two methods can be a powerful way to take advantage of the pros while avoiding all of the cons for mid-size companies. To learn more about what to expect when working with an outside partner (and the 5 IT questions you should be asking), download our free guide: The Ultimate Small Business Guide to IT Outsourcing.